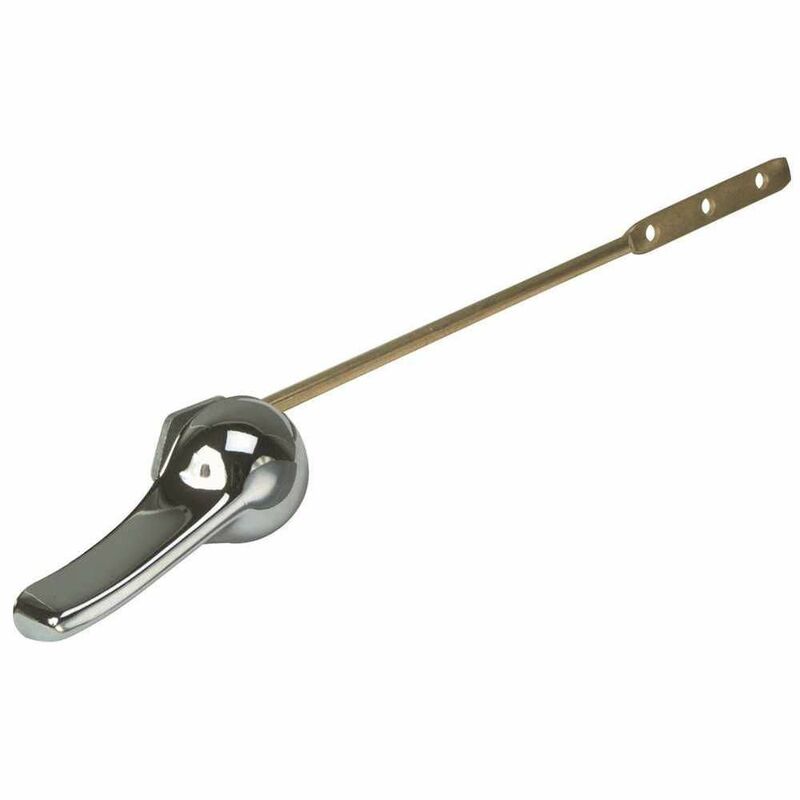 This universal tank lever measures 8 inch in length and features a regular single action. It also easily installs with a zinc spud and nut, a chrome-plated handle, and a brass arm. Replacement Toilet Tank Lever for American Standard 4 and 1/4 inch Chrome . JAG Plumbing Products strives to bring customers the best products in Canada and make them available on the best online shopping platform: Homedepot.ca - Owned and Operated in Ajax, Ontario, Canada, JAG PLUMBING prides itself on offering Home Depot Customers durable, high quality, non OEM replacement plumbing parts. Now you can repair your designer style Toto brand toilet easily and economically with the JAG PLUMBING PRODUCTS replacement toilet tank handle. This handle is made to replace the Toto metal handle model number THU148. JAG Plumbing Products strives to bring on-line Customers the best replacement and repair parts. Experts in the field of plumbing repair parts; JAG Plumbing offers customers a selection of economic solutions for their every-day home plumbing repairs. The Team at JAG scours North America to bring The Home Depot customers unique, hard to find parts of the highest quality. Replacement Toilet Tank Lever, Universal Fits 3 ways, Chrome . JAG Plumbing Products strives to bring customers the best products in Canada and make them available on the best online shopping platform: Homedepot.ca - Owned and Operated in Ajax, Ontario, Canada, JAG PLUMBING prides itself on offering Home Depot Customers durable, high quality, non OEM replacement plumbing parts. Designed to fit the majority of toilets, the Korky StrongARM Handle & Lever easily adjusts to fit all tank positions including: front, side, angle, right and down. Optimized for use with both 2 inch & 3 inch flappers and canister-style flush valves, the engineer grade material in common stress areas performs as well as brass and aluminum levers. The StrongARM lever is adjustable to eliminate the need to bend for fitment and fits most popular brands, including American Standard., Kohler., TOTO. & others. The classic style handle, in a chrome finish, is a great way to upgrade any toilet and compliment the bathroom's decor. Easy to install, the 6050 includes: (1) Chrome Handle, (1) Tank Lever Arm, (2) Locking Clips and (1) Stainless Steel Lanyard Hook. Universal Tank Lever, 8 inch This universal tank lever measures 8 inch in length and features a regular single action. It also easily installs with a zinc spud and nut, a chrome-plated handle, and a brass arm.